Jimbocho Den is one of my favorite restaurants in Tokyo. Featured by Michelin Guide with one star for successive years since it was opened. Every meal at Den was amazing, owner-chef Zaiyu-san serves authentic Japanese dishes in his own way, creative, playful but really delicious. The ambiance is more homey and relax. Chef Zaiyu-san and the whole team are very patient and friendly. In my word: Den is not necesserily the best, but always a right place to go. The restaurant locates just next to Jimbocho Station. Foie gras Monaka, a classical one at Jimbocho Den. Inside the cirspy wafer is cold foie gras and ingredients changed seasonally. This time we had dried persimmon from Akita area (秋田) and smoked Japanese pickles.Foie gras was smooth and delicious as alwyas, dried persimmon gives a chewy texture and sweet flavor, pickles were crunchy and balanced well the whole thing. The second dish was a warm bowl of Chawanmushi (steamed egg custard) topped with oyster cream and spinach sauce. We were told to scope it from bottom to top thus we can taste all the three ingrdients every bite. The chawanmushi itself was silky and the umami oyster cream enhanced the flavor of the entire dish, spanich sauce made of Kyoto spinach was naturally sweet - probably the sweetest spinach i have had in this season. Overall very mouthful and left a lovely aftertaste. Finally had my 'customerized' DFC with my face on the box (looks a bit wired though). The filling of DFC changes frequently depends on the best of the day. As Janurary is the new year month in Japan, most restaurants serve dishes with a new year twist. This time, Chef Zaiyu-san stuffed the chicken wing with pickled vegetable Nozawana (野沢菜), mochi rice (glutinous rice) and sesame. The concept is from Oyaki (おやき) - Japanese dumpling that Zaiyu-san's always have in his hometown during new year. Zaiyu-san is very good at aged sashimi. The Buri (yellowtail) i had last time was amazing, so was the Sawara sashimi this time. It was aged for 4 days with soy sauce, it was rich in oil but not that greasily rich as fatty tuna, the creamy texture and the deep umami flavors was unforgettable. Wonderful. The grilled Japanese Duck was too well-done. The skin was cripsy and the medium-cooked meat was succulent and flavorful. The bitterness of the crispy black cabbage and sweetness of the bamboo shoots were awesome pairings. 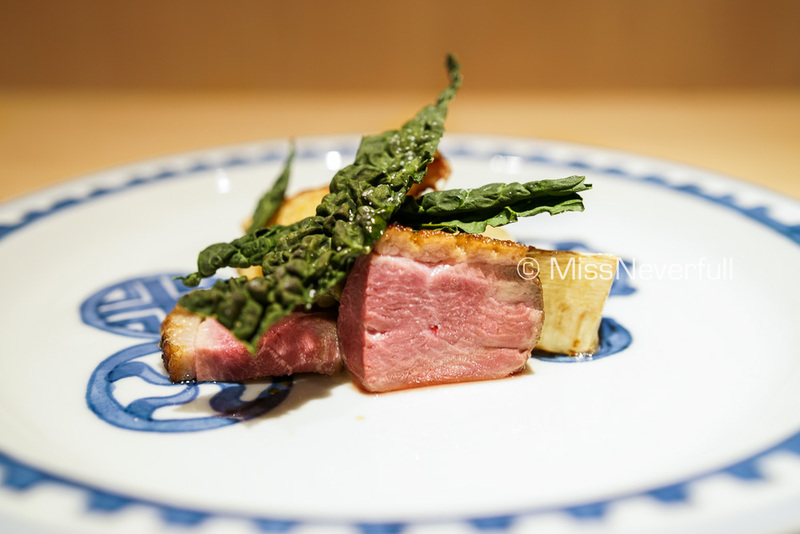 Duck and leek is a very traditional combination in Japan, the leek puree was incredibly smooth and sweet. The last dish before the rice is always a bowl of salad, which is a signature dish at Den. All the vegetables are sourced from Zaiyu-san's cousin's farm in Mount Fuji. Besides the mixed green leaves, all the other vegetables are prepared in different ways to give different textures. On top is a huge ant which has been drinking water for seven days. The acid in its body gives it a sour taste and crunchy texture. Zaiyu-san also gave each of us a baby ant for tasting. Chef Zaiyu-san prepared two rice dishes for us, the first one was steamed claypot rice topped with grilled Nodoguro (black throat fish). The fish was marinated with soy sauce before grilling, thus it was much more flavorful. The flesh was very moist and delicious, the sesame and scallions nicely enhanced the fragrance and flavor. The rice dish was served with homemade pickles (light) and miso soup. The second rice dish Zaiyu-san prepared for us was topped with sliced raw Wagyu sirloin from Hokkaido. Zaiyu-san covered the pot with a lid to 'cook' the beef after he showed us the rice. The beef was very tender and mouthful, serverd with some wasabi (not spicy at all) to balance the flavor. My partner was a first-timer, thus he had the signature cream cheese dessert. I had the Yuzu jelly with vanilla mousse served in a yuzu. The yuzu jelly was very refreshing to balance the creamy mousse.